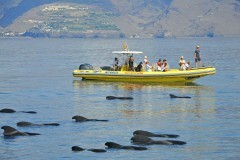 The tour to Los Organos takes you all the way along the northern coast of La Gomera. Here awaits the guests onboard the Speedy a landscape that could hardly be any more varied. From the port of Valle Gran Rey it goes, on the 20-kilometer route, past abstract cliffs, wide breathtaking valleys and secluded coves. 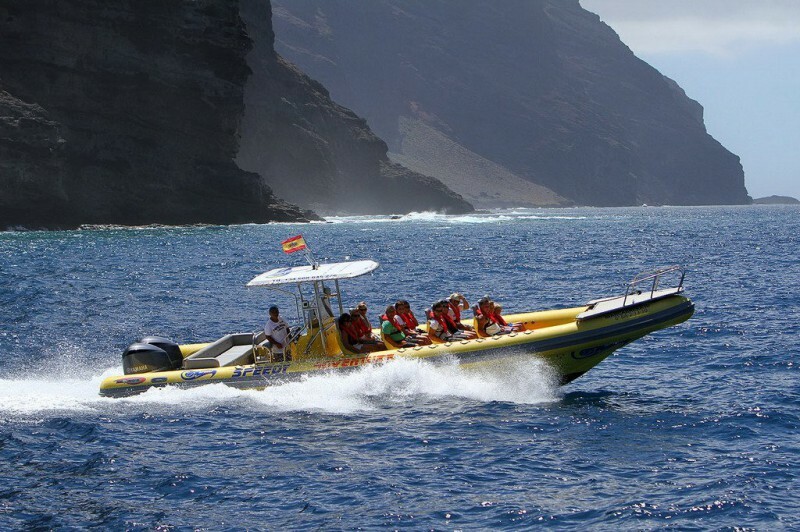 The tour takes us from the harbor in Vueltas after only a few minutes past La Playa and the popular beach Playa Ingles in Valle Gran Rey. The route to the impressive organ pipes continues passing the villages of Tagugluche, Alojera and Tazo, as well as the Barranco Arguamul. Not only the monument of Los Organos itself is stunning, also the route to get there is an absolute highlight. The northern coast is much rougher than the southern coast, therefore it is also mainly pristine. 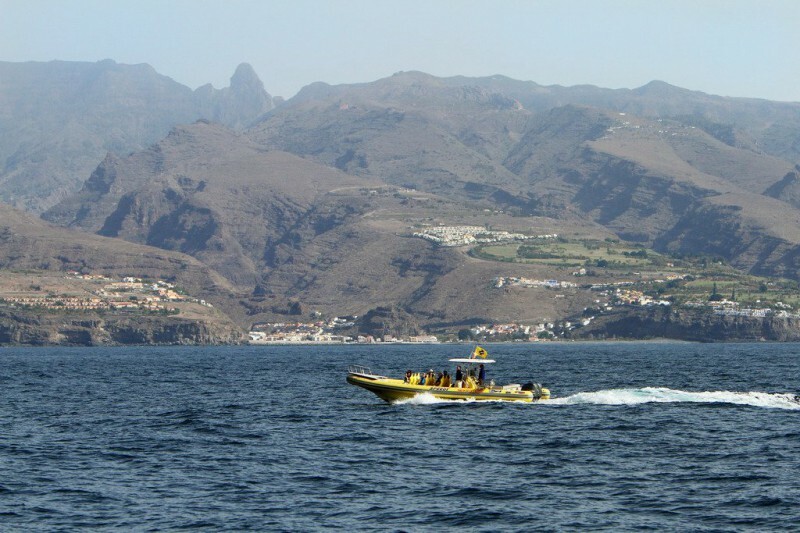 Although the northern areas used to be only sparsely populated, they played an extremely important role in the economy of La Gomera. The fertile soils gave especially rich harvests of corn and tomatoes. The first place we pass by, just “next” Valle Gran Rey, is Taguluche. This place is located on the ridge of La Merica and was once considered one of the most productive areas for growing tomatoes, which were also exported from here. During the 19th century there was still a lively ambience, but now only a few families live here. Of particular importance for the production of the popular „miel de palma“, the palm honey, was Tazo. From the over 12,000 date palms standing in this village, came most of the palm sap, which is needed for the production. From aboard the Speedy one can grasp the full extent of the wide palm oasis. Shortly before getting to Los Organos we pass by the Barranco Arguamul, which formerly belonged to the most fertile areas in the north of the island. Especially the thriving cultivation of grain was profitable. Today mainly the old houses with traditional construction methods determine the image of the region. 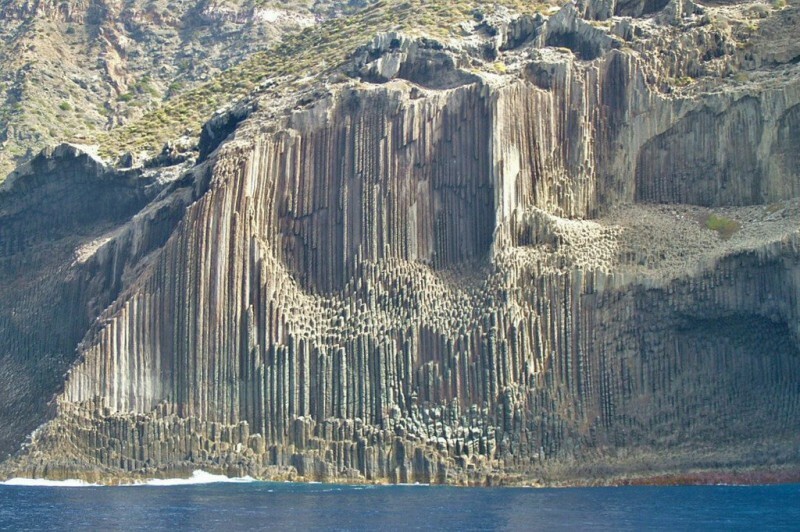 The rock formation Los Organos is a unique natural monument. It is located on the coastline below Vallehermoso. 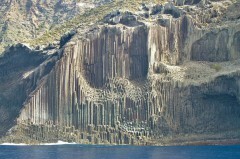 It consists of huge basalt columns that very uniformly protrude vertically out of the water. 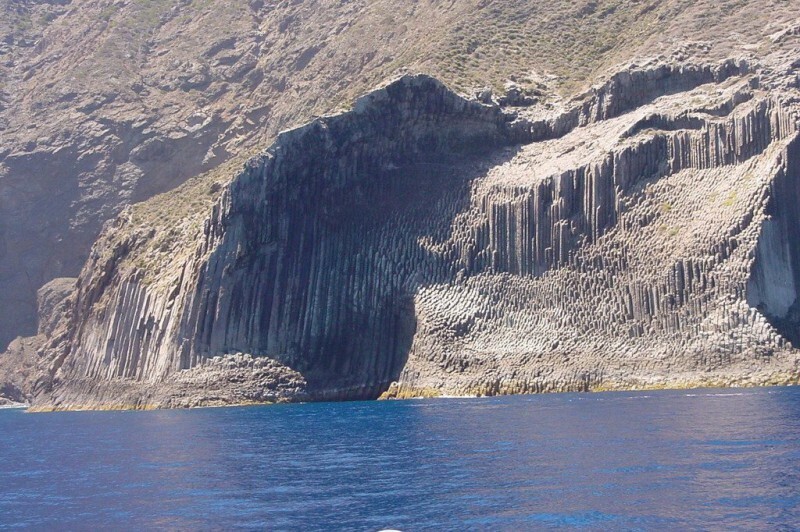 Translated the name means „organ pipes“ because its sight is reminiscent of precisely this. Individual columns have a diameter of up to one meter. The entire monument has the impressive height of about 80 meters and is almost 175 meters wide. The monument of Los Organos belongs, in addition to the Garajonay National Park and the cloud forest, to the landmarks of La Gomera. 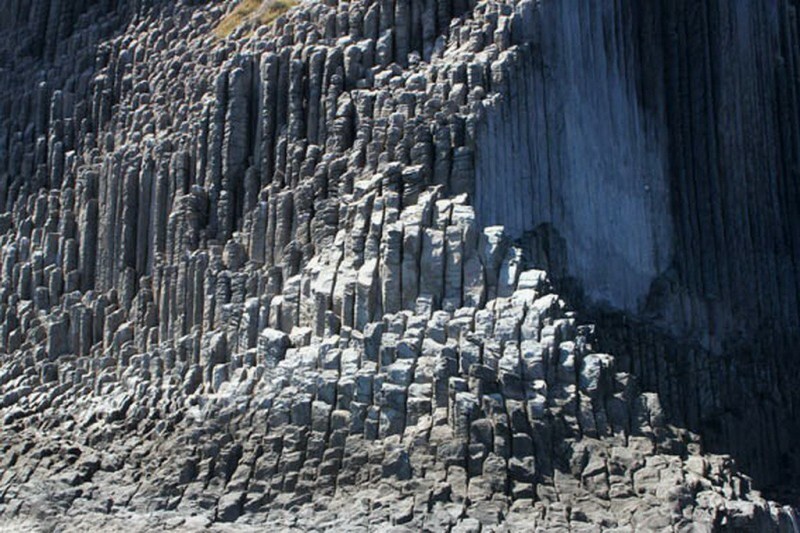 The impressive natural artwork was once created by hot volcanic magma, which cooled down extremely slowly and uniformly, and then shrunk. The erosion by the sea has exposed the rocks over time. 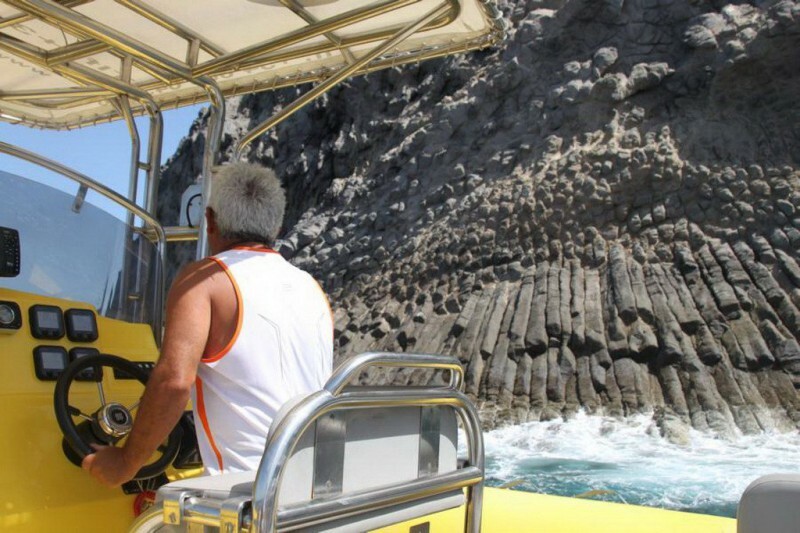 Since basalt rocks of Los Organos can only be seen from the seaside, this excursion is one of the most favorite activities of La Gomera visitors. The great thing about the Speedy here is, that it can approach very closely to this natural wonder. On a clear day, from here, the northernmost point of La Gomera, one can enjoy a great view to the Teide mountain on Tenerife. From here we head back to Valle Gran Rey. 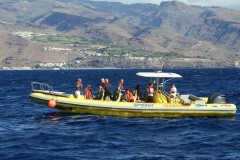 The tour to Los Organos is offered several times a week by Speedy Adventure, on Mondays, Tuesdays, Fridays and Sundays. However, the weather conditions should always be considered as the Atlantic on the north coast is often wild. 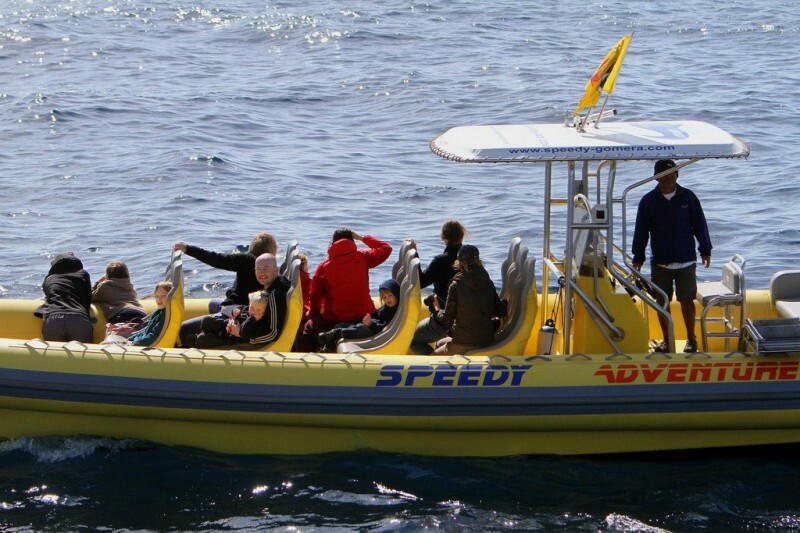 But the Speedy is great for this tour because it is very stable on the sea even when rougher. 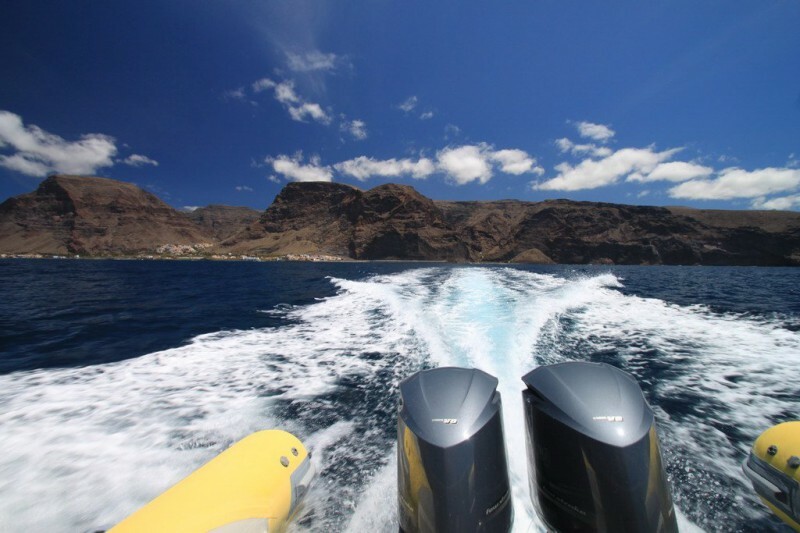 The powerful engines of the boat help to dominate the sea. 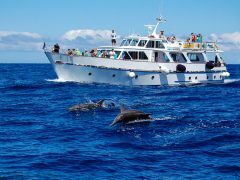 With a little luck you can even meet a few dolphins during the ride that accompany the boat a little bit. The tour takes about 2 hours. Departure is in the port in Vueltas, in Valle Gran Rey. More information about the tours and the weather conditions you can get from Angela, Antje and Tine in our office in the port.